Editor’s Note: For some unknown reason, the author did not specify precisely in what part of the Southwest the events were held. 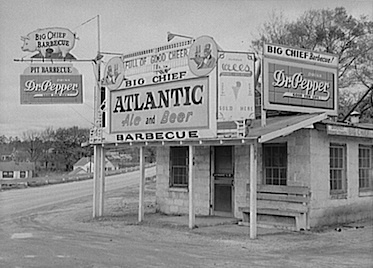 The barbecue was an established institution in the Southwest. It had in no other part of the country so many devotees. There was a charm in the name that would at any time call together a large concourse of people, on the shortest notice, and for any occasion. And the savory smell of roasted ox, sheep, shoats, turkeys, rabbits, or whatever else was prepared to appease the appetite of a crowd, would keep them together to hear the longest political speeches, listen to the most protracted school examinations, give their attention to the most elaborate expositions of the importance of some projected turnpike or railroad, and secure a patient waiting and an unbroken audience on any occasion when the barbecue feast was to be the agreeable conclusion. On arriving at the spot my curiosity was abundantly gratified and rewarded. I saw for the first time an immense ox in the process of being barbecued. And this was the process: A large trench had been dug in the ground, about six or seven feet wide, eight or ten feet long, and four or five feet deep. This trench had been filled with the best quality of beech or maple wood from the body of the trees. This had been set on fire and burned until there was left a bed of burning coals, some two or three feet deep, that did not emit a particle of smoke. The slaughtered ox had been laid completely open, and two large spits, about eight feet long, had been thrust through each fore and hind leg lengthwise, and four negroes or more, taking hold of the ends of these spits, had laid the ox over this trench above this bed of burning coals. There the bovine monarch lay, cooking as beautifully as in my childhood I had seen many a turkey, suspended by a long string, swinging before the large wood-fire that was burning and blazing upon the ample hearth of our family kitchen. And it was upon the same principle—the juices were all cooked in. The negroes were gathered around the ox, with large swabs upon long sticks, with which they incessantly “basted” it, with a liquid prepared for this purpose and standing in large kettles on either side of the trench. From time to time the large bed of coals was stirred, and occasionally they performed the difficult feat of turning over the entire ox, so that each side might be cooked at an equal rate of progress. This work they greatly enjoyed. There was enough of the wild and strange about it to gratify their excitable natures. For the time being they were supremely happy. The stillness of the night, the surrounding darkness, and the gleams of that large and brightly burning bed of coals in the overhanging tree-tops, gave to the whole scene a weird character which awoke all the enthusiasm of their untutored natures. Through the long night they cheerfully plied their task, stirring up from the depths the live burning coals, and ” basting” and turning the ox as often as was necessary. Frequently they sang those strange, wild African songs that they are accustomed to improvise while at work and upon all kinds of occasions, and as they echoed among the forest-trees and floated out upon the night-air, the soft, sweet melody was most enchanting. As I left to go to my room for the night, and turned to look back upon them from the darkness, the strange scene seemed not unlike a company of Druid priests offering a sacrificial victim in some grand old English forest. In the morning I made them another visit. Many of the coals had turned to ashes, and the bed was much reduced in depth. But when the negroes put in their long poles, they stirred up an abundance of bright coals from the bottom. 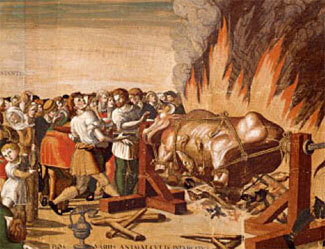 The ox, which had been placed over the fire at sundown the night before, was to be cooked until noon, when the grand barbecue dinner was to be eaten. The smaller animals, such as sheep and shoats and the various kinds of poultry, were to be placed over the fire in time to be nicely cooked by this hour. At that time every portion of the ox would be thoroughly done to the bone; not baked and burned and dried, but made more juicy and tender and sweet than any one has ever once dreamed that the best of beef could be who has not eaten it cooked in this manner. I have never, at the most magnificent hotels, or the most luxurious private tables, eaten any kind of meat, poultry, or game that was so rich, tender, and agreeable to the taste as that barbecued in the manner I have described. This was a political barbecue, at which several distinguished speakers, candidates for various offices, were to address the people. But my engagements for preaching, and other duties connected with my mission the next day, were such that I was compelled to leave immediately after breakfast. I could not hear the speeches, see the long tables, made of rough boards, spread under the forest-trees, participate with the immense throng in their barbecue dinner, and witness and enjoy all the strange and varied scenes and incidents inseparably connected with such a gathering of all the “sovereigns” in the Brush. But what I have said will suffice to give my readers the modus operandi of a barbecue. It will be seen that it is the simplest possible manner of preparing a dinner for a large concourse of people. It requires neither building, stove, oven, range, nor baking-pans. It involves no house-cleaning after the feast. It soils and spoils no carpets or furniture. And in the mild, bountiful region where the ox and all that is eaten are raised with so little care, the cost of feeding hundreds, or even thousands, in this manner is merely nominal. Hence barbecues have been for a long time so common and popular in the Southwest. There have been unnumbered political barbecues, where the eloquence peculiar to that region has been developed, and where vast audiences have been moved by its power, as the trees beneath which they were gathered have been swayed by the winds. In the published life and speeches of Henry Clay are several that were delivered at different barbecues, where he addressed the people on state and national affairs, with an eloquence and power equal to, if not greater than, that with which he enchained the Senate. There have been barbecues in connection with school-examinations, and Sabbath school celebrations where educational and religious topics have been discussed. 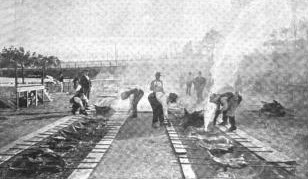 There have been barbecues in connection with meetings in favor of turnpikes, railroads, and all kinds of internal improvements. There have been uncounted barbecue-dances, and barbecues for more occasions than I can name. But of all these I will only describe a large wedding, that was succeeded by a barbecue-supper, that I had the pleasure of attending…. 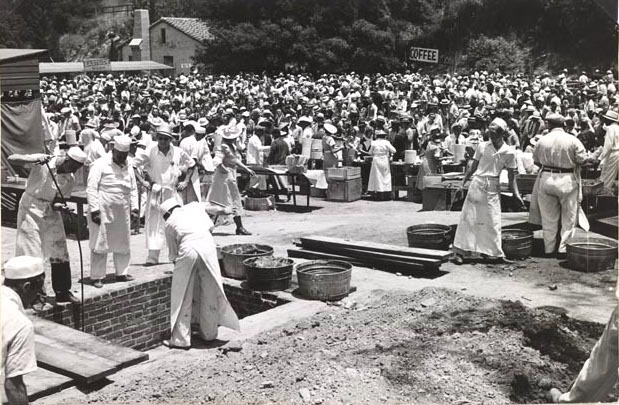 As the sun declined, the arrivals increased until the numbers swelled to scores, to fifties, and, when all had assembled, there were in and around the house more than two hundred. It was a genial, happy throng. All were in the best possible humor. There were pleasant, kindly greetings between the old, and frolic and flirtations among the young. At about nine o’clock the wedding ceremony was announced, and as many of the guests as possible assembled in the largest room. The bride and groom, with bridesmaids and groomsmen becomingly attired, entered the room where we were gathered, and the ceremony was performed by a clergyman of the neighborhood, which was followed by the usual congratulations and greetings. And still others were waiting, and after them all the colored servants were to have their feast—in all, more than two hundred. This was the condition of most of the houses in the neighborhood. When we returned, we found a large company and an abundant breakfast. After mingling with the departing guests for a time, I renewed my congratulations and good wishes for the happy pair, and bade good-by to my kind friends, greatly pleased with this entirely new experience at a wedding. Such is a simple, unadorned narrative of a wedding, with its barbecue feast, at which I was a guest in the Southwest. How unlike those that I have attended in our largest cities! But who shall say at which there was the greatest and most universal happiness, whether where wealth and fashion held high carnival, or at this more simple and primitive gathering and feasting of old neighbors and friends in the Southwest? 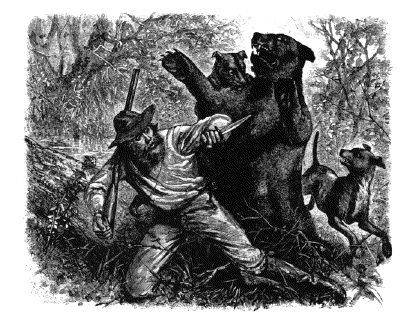 From: In the Brush, or Old Time Social, Political, and Religious Life in the Southwest, by Rev. Hamilton Pierson. New York: D. Appleton & Co., 1881.